Image: courtesy of Ontario Wind Resistance – click on it to enlarge. Throughout the world, ever since shocking mortality statistics at wind farms made the news 15-20 years ago, efforts have been made by the wind industry and complicit governments to hide the numbers. In the UK for instance, wind farms have long stopped being monitored for mortality. In Spain, the monitoring has been done, but the reports got filed away without publishing. Elsewhere, whenever a wind farm had to be checked for mortality, its owner would select ornithology consultants based on their reputation for “cooperation” i.e. whose reports always showed “manageable” numbers. This is still the preferred method for covering up in some countries, e.g. Canada or Australia. To make it even safer for European wind developers, and regardless of the proclaimed right of the public to be informed on environmental matters (Aarhus Convention), reports concerning wind farms’ impacts on birds and bats were soon stamped “property of the developer”�, meaning that he may edit them before publication. Indeed, wind companies do tamper with these impact assessments, said to me an English ornithologist who had worked for wind developers. But a non-disclosure clause in the contract kept him from revealing publicly what he knew and what he saw. This is now standard practice in wind farm monitoring contracts. 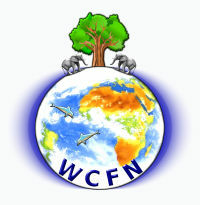 Thanks to these various methods for hiding the evidence, high mortality numbers soon disappeared from the headlines, and the public lost interest, trusting large ecology NGOs and bird societies to watch over protected wildlife. However, conflicts of interests oblige (i.e. $$$), these organizations keep denying that significant harm is being done to biodiversity. For instance, none of them has published the report by the Spanish ornithological society revealing millions of deaths a year in Spain. Yet it is based on 136 monitoring reports obtained from the Spanish government under Freedom of Information legislation. Granted, the very large Altamont Pass wind farm, which killed 2,900 golden eagles in 25 years, kept coming back in the news now and then. But the media has become so gullible (or complicit?) that even its repowering for another 25 years didn’t make waves. The issuing by the US administration of “incidental take permits”, allowing wind farm operators to kill a specified number of eagles accidentally, did cause anger among bona fide conservationists, especially as wind farm operators can easily lie regarding the actual number of eagles they kill. But this scandal didn’t make the evening news on television. Most NGOs don’t really mind: there is no money in protesting, but plenty of it to be reaped from Big Wind, awash as it is in subsidies. In Scotland, an issue that could become a hot potatoe is the census of golden eagles. Originally due in 2013, this politically-sensitive 10-year survey was postponed to 2015, and to date we are still awaiting its publication. Cynics are suggesting that it takes time to massage the figures upwards so as to reassure the public and permit more wind development across the Scottish moors. In the meantime, a curious study made the headlines in Edinburgh, claiming that wind turbines “have no effect on eagles”. I happen to have visited the Beinn an Tuirc wind farm where the study was made, and denounced an earlier mendacious report published about it. The new one is no better. There is nothing credible about it, for we know that wind turbines attract (and kill) eagles, as they do other raptors, swallows and bats – see Biodiversity Alert. It is just another one of the many doctored studies financed by wind interests. If you read the press article till the end, you will note it claims that the Beinn an Tuirc wind farm actually helps Scottish eagles survive (sic). As Goebbels is reputed to have said, “the bigger the lie, the more it will be believed”. The population survival issue was tackled differently in the western United States: the golden eagle survey was carried out from a plane. Obviously, scientific rigor was lacking: seen from an aircraft, it is easy to mistake a juvenile bald eagle for an adult golden eagle. The windfarm coalition used this worthless census to report a “stable golden eagle population” in the western States. Different methods, same misleading result. One of the countries where the cover up wasn’t achieved at 100% is Australia. Mortality at the infamous Woolnorth wind farm apparently ceased being reported to the public, but a few months ago, that of the Macarthur wind farm made the news, causing concern worldwide. More recently, another Australian wind farm discreetly announced (you have to search their newsletter ** thoroughly, page 2, paragraph 3) that it was killing many eagles: Bald Hills wind farm – 7 eagles killed in 4 months. Seven in four months is the “official” figure, so the reality could be even worse. 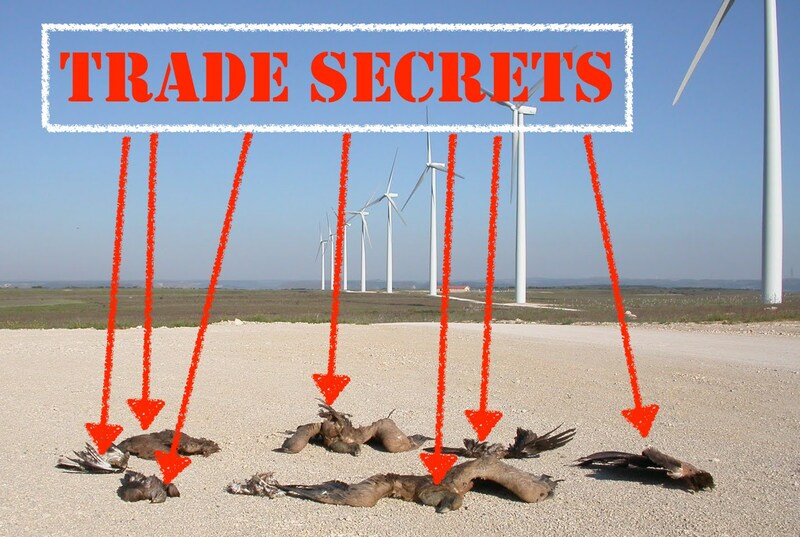 It’s also a good indication that, as revealed by Save the Eagles International, raptors are attracted to wind turbines (and then killed). But don’t be surprised that, in spite of the evidence provided in STEI’s article, bird societies completely ignore this lethal attraction exerted by wind turbines: it would hurt the wind industry if they recognized it. Here you can, again, appreciate the hypocrisy surrounding the whole issue. 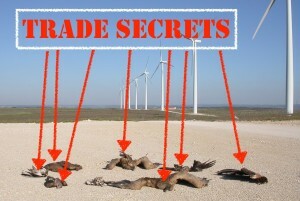 Finally, the cover up is naturally helped by scavengers, which become rapidly aware that wind turbines provide easy food in the form of dead or injured birds and bats. So they make the rounds daily, mostly at night or at dawn when their chances are best. Searchers employed by consultants rarely start their work as early as foxes and crows, so they miss most carcasses. In addition, they visit the site once every week at best, leaving plenty of time for scavengers and wind farm employees to remove most evidence of the massacre. That is how the company operating Bald Hills WF, above, can claim they only found 19 bird carcasses (assuming the figure wasn’t simply pulled out of a hat). You will note that there were 7 dead eagles among them: typically, small carcasses disappear whole, while larger ones often leave some remains behind. Wind farm operators have been known to instruct their employees to bury the evidence, but some carcasses can escape their vigilance, given the extension of the surfaces to be searched, and the vegetation. At Altamont Pass, California, Dr Smallwood estimated in 2004 that 116 golden eagles were being killed yearly by the 5,000 (small) wind turbines (1). These mostly young, wandering eagles, were from California, the western United States, and even Canada. The massacre will continue as new, bigger turbines replace the old ones. The “green” NGOs don’t really care: do we hear them protest? The killing is now legal (incidental take permits), and that keeps the operators out of trouble if some eagle carcass happened to be discovered by a member of the public. The wind industry wins: the extermination of eagles, hawks, falcons, cranes, swallows, owls, bats and other highly valued species may continue unabated. Thanks, Mark Duchamp. Superior clear reporting on this heinous and disgraceful cover-up. It is clear that money is King, and the utmost hypocrisy is being used to guarantee the flow to the developers, with scavenger groups like government and individuals along the way. This story needs to be circulated widely. Will do our part.